It may have taken over a year to get started following the Get Carter car park’s demolition, but building work at Gateshead’s Trinity Square is now proceeding apace. 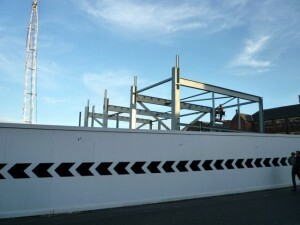 Construction of the £150m development only began at the start of November, but the speed of progress has been impressive since I photographed the first section of steel frame less than two months ago (below), close to where the car park entrance ramp used to be. 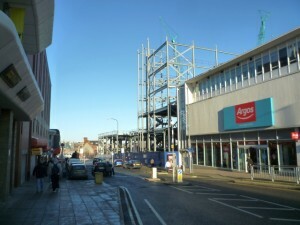 That part of the scheme now towers over the adjacent three-storey New Century House (formerly the Co-op department store; now Argos and other shops), giving a first sense of the development’s scale along West Street – what is currently, to all intents and purposes, Gateshead’s main shopping thoroughfare. 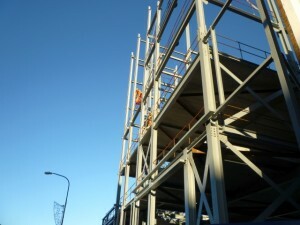 As well as the steel frame, concrete floors and staircases are also starting to go in. 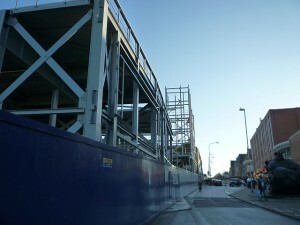 Further down West Street, another section of Trinity Square is taking shape opposite the existing Iceland and Heron Foods stores. 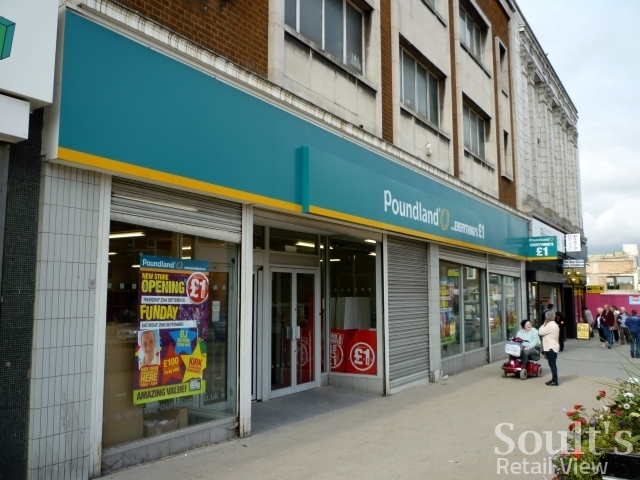 Overall, it’s possible to start making out the shape of the scheme on the ground in relation to the numerous artists’ impressions that the developer, Spenhill (a subsidiary of Tesco), has made available, even if the images do make West Street look unfeasibly wide. When complete, the development will include a 175,000 sq ft Tesco Extra store, an additional 170,000 sq ft of new retail and leisure space (comprising up to 42 shop units and kiosks), over 750 parking spaces, and a 993-room student village. 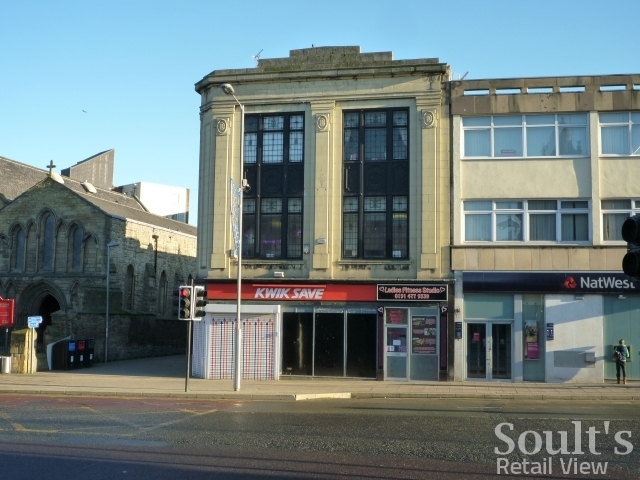 I understand that several well-known retail names are already lined up for the scheme, though one or two are likely to be relocations from older or overrented space elsewhere in the town centre. Anyone who follows my blogs or tweets will know that I’m not always an enthusiast of Tesco. However, from the perspective of both a retail commentator and a Gateshead resident, I stand by my positive view of the development. 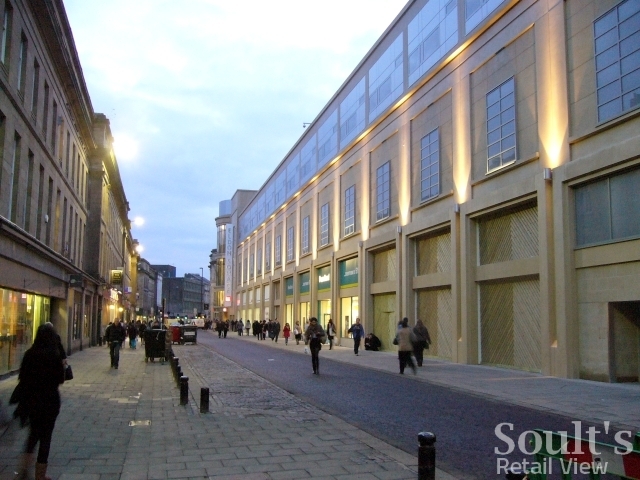 For me, the scheme’s unashamedly modern design and scale is much more successful, for example, than the strange modern-classical hybrid adopted by Newcastle’s recent Eldon Square extension (below). 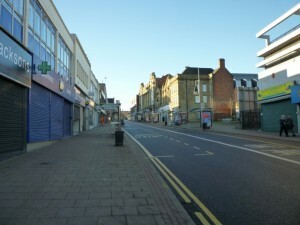 The potential of a monolithic Tesco development also seems to have been avoided, both in terms of physical connectivity and the mix of uses. 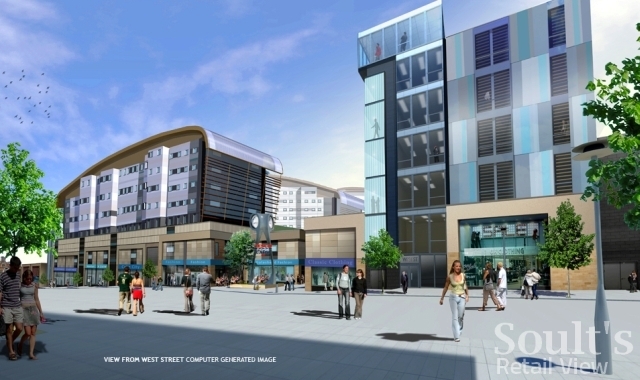 With regard to the former, the plan and images show additional shops lining West Street and High Street, as well as a new store-lined street that will connect West Street to High Street via the new town square. 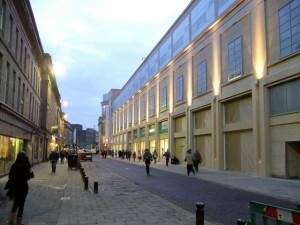 Together with a further pedestrian link, to Jackson Street (emerging beyond Hutchinsons in the photograph above), these connections should ensure that Gateshead town centre’s existing businesses – including recent arrivals such as Poundland (in the former Woolworths) and Wetherspoon’s – benefit from the extra footfall that the development is bound to generate. 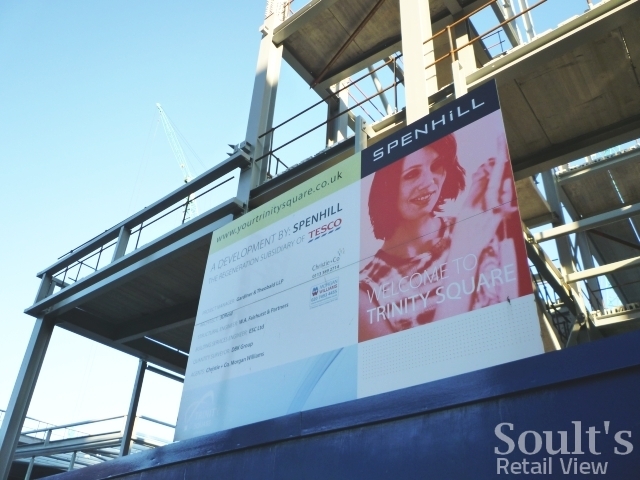 Overall, Spenhill predicts that the scheme will result in an increase in the town centre’s retail turnover potential from £74m to £160m, and that Gateshead’s RetailVision CentreRanking will “improve by over 500 places”. 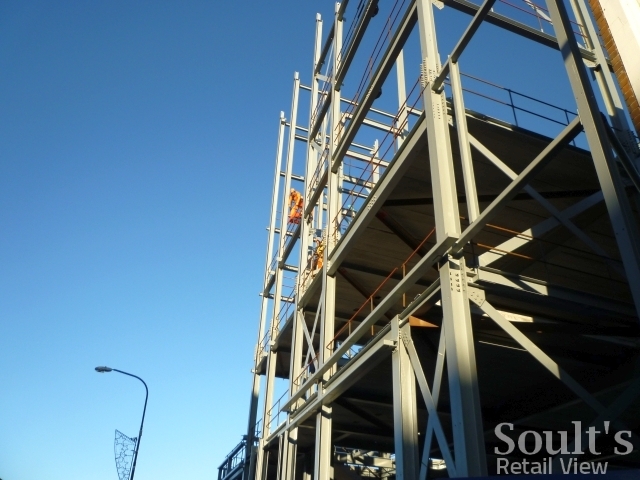 In terms of the mix of uses, the development also seems to get things right. In addition to the retail space, the introduction of leisure uses and a sizable student housing component should help to address two of Gateshead town centre’s other flaws – a very limited bar and restaurant offer, and next to nothing in the way of town centre housing, both of which currently create an eeriness and lack of activity at night. For now, however, Gateshead shoppers still have to wait a few years longer before the development is complete. 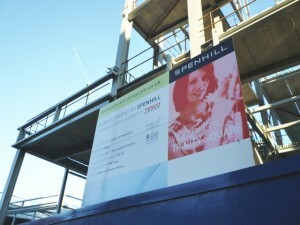 The latest issue of Gateshead Council News reports that the current Tesco store will close in mid-2012, with the new store (on much of the same site) opening in spring 2013, and the student housing being completed in summer 2014. 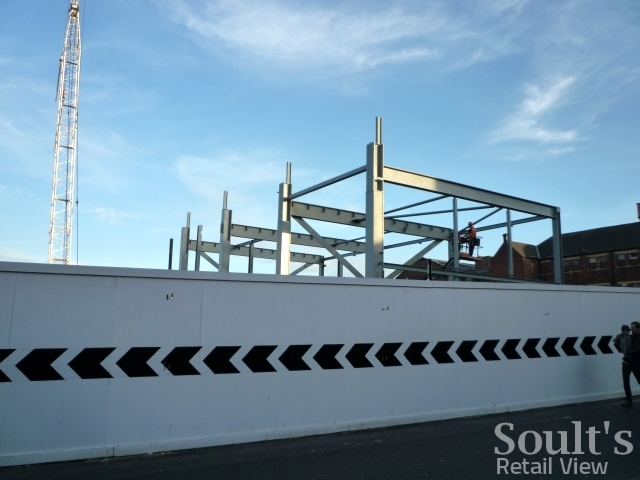 A temporary Tesco (probably in the Metro format, given the unit’s size) is expected to operate from the old Kwik Save site in the High Street in the interim. 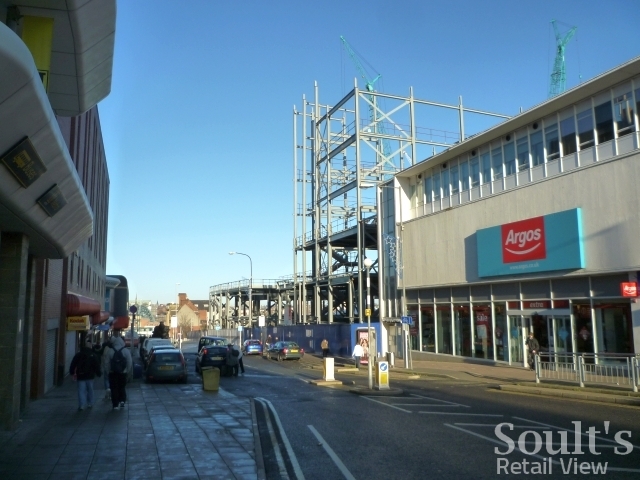 Apart from the buzz that the students on site will bring to the scheme, Trinity Square will mean that Gateshead’s other residents also finally have a town centre that is a viable place to shop and go out in, rather than always having to head to Newcastle or Metrocentre. 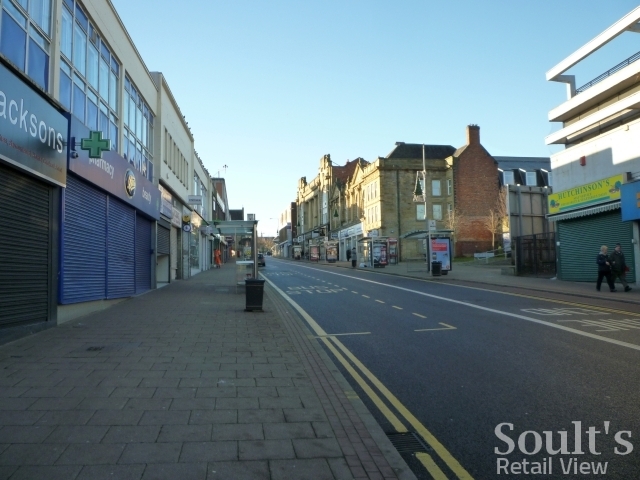 At a time when Mary Portas and others are encouraging us to support and regenerate our local high streets, bringing Gateshead town centre back to life – through a bold mix of retail, leisure and housing – must surely be a good thing.